Riley Shaughnessy knew that to stand out in his large family, he'd have to go big. Making a name for himself as a musician wasn't easy, but he followed his dreams to rock-star success. But the relentless expectations of fans is not helping the slump he's in now. So of course the person who attracts him is the woman who is not impressed by fame. Entertainment reporter Savannah Daly is completely unfazed by pretty-boy rock stars. She's just here to get her interview and write her story. But spending an entire month with the Shaughnessys is going to show Savannah a side of Riley she never could have guessed. 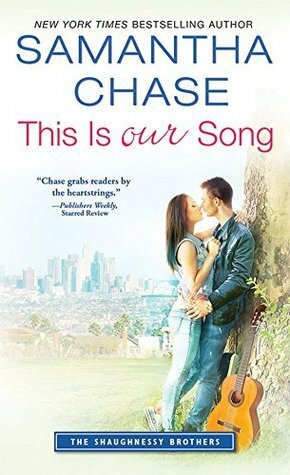 With the next story in The Shaughnessy Brothers series, Samantha Chase continues her unique way of weaving a story that has us falling in love with this big, boisterous family again and again! We got a good look at the rock star of the family with a couple of the previous brother’s stories, so we already knew we were going to love Riley, we just didn’t know exactly how much. He’s sweet, he’s kind and underneath all of the glitz and glamour, he’s just a real guy hoping for a happy ending just like the rest of us. I was especially touched by the scenes depicting his closeness with their Mom that we’ve heard so much about. Great story! Riley Shaughnessy went out and made that rock star name for himself that he always dreamed of, but when it came time that he wanted a break and wanted to tone it back a bit to a more laid back approach to his music, he had the horrible luck of hitting a slump! He’s at a loss of what to do to get his mojo back again, when he’s faced with being forced to do a big interview or catch a fit from his record label. Savannah Daly enjoys her job as an entertainment reporter, but she isn’t blown away by the typical egotistical rock stars, so when she’s handed Riley as an assignment, she’s not exactly thrilled. She sets out to do her job and get it done … but there’s much more to Riley than she ever expected! Will a month spent with the big Shaughnessy brood have her wishing she were an honorary member? What a lovely review!! Thank you so much!! !